The Verdon River flows through the magnificent Verdon Gorge canyon and is considered one of the most beautiful places to visit of the Provence, France in Europe. The Verdon River is located in south-eastern France, is about 175 kilometers long and the source of the river is at an altitude of 2,400 meters in the Maritime Alps. The appearance of the water of the Verdon River is an amazing green color which makes the scenery even more incredible. On its way through the canyon the Verdon River passes through different man-made lakes and then flows into Lac de Ste Croix in Parc Naturel Regional du Verdon in France, Europe. 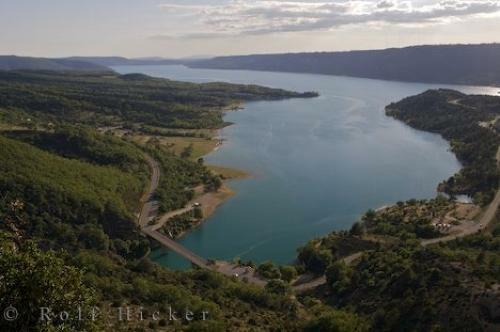 Photo of the Verdon River and the stunning landscape of the Provence, France in Europe. The Verdon River flows into Lac de Ste Croix from the Grand Canyon du Verdon, Gorges du Verdon, Parc Naturel Regional du Verdon, Alpes de Haute, Provence, France, Europe. I photographed this photo with the digital SLR camera model Canon EOS-1Ds Mark II, aperture of f/8.0, exposure time of 1/200 sec. on ISO 100, as always I used a original Canon Lens, the focus lenght for this picture was 34mm.